Enjoy your time away knowing your pet is having fun with furry friends. Contact Camp Bow Wow Lawrence today at (317) 794-3647 to learn more. Your dog is your family – at Camp Bow Wow Lawrence, we understand that. As dog lovers ourselves, we take your pup’s care very seriously. That’s why we think of ourselves as so much more than just a dog boarding service. We are here to provide love and support for your furry family member while you are away—filling that gap as best we can until your return. Price is per night. Dog daycare is included in all overnight dog boarding stays. 10% discount for 10 or more consecutive nights. Two Campers from same Household sharing Cabin. Price is per night. 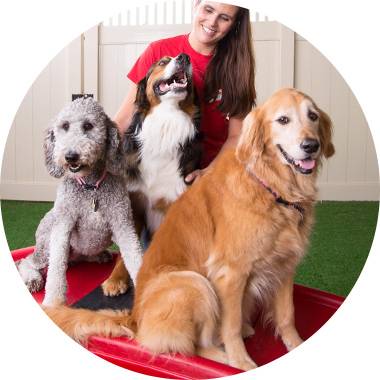 Dog daycare is included in all overnight dog boarding stays. Dogs must be from same household and must share cabin for multi-dog pricing. 10% discount for 10 or more consecutive nights. Price is per night per additional dog from the same household sharing Cabin. Daycare is included in all overnight stays. 10% discount for 10 or more consecutive nights. Price is per night. Daycare is included in all overnight boarding stays. 10% discount for 10 or more consecutive nights. Price is per night. Daycare is included in all overnight boarding stays. Campers sharing suite must be from the same household. 10% discount for 10 or more consecuitve nights. Price is per night per additional dogs from the same household sharing Suite. Daycare is included in all overnight stays.10% discount for 10 or more consecutive nights. Nights can be used at any time and do not have to be used consecutively. Nights can be used at any time and do not have to be used consecutively. Campers must share the same cabin.